Nope. I’m out. I’m all for the advancement of technology, but this is where I draw the line. A few weeks ago that video surfaced of the robot doing backflips. While terrifying, it was still impressive and downright cool. Sure, it can stick a backflip dismount better than anyone that’s ever stepped foot in Béla Károlyi’s gym. But I was at least entertained watching that demonstration; fearful of our imminent death but entertained nonetheless. This is not funny or cute or entertaining one bit. This is horrifying. 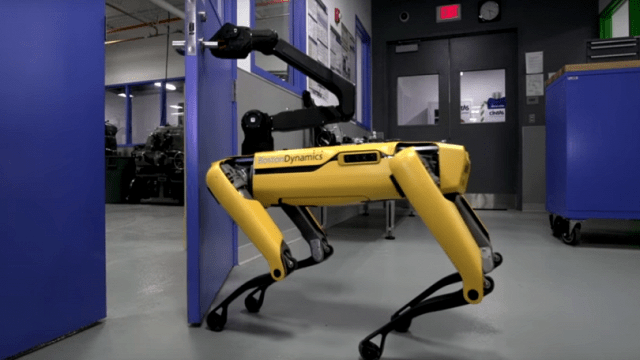 What do we gain from having these four-legged robotic monsters strutting around and opening doors at will? It’s all over for us, people. Game over. Blouses. Humanity as we know it no longer exists. Society is being uprooted as we speak. The takeover has begun a long time ago with robotics and technology, and I’ll even toss aliens into this category. Here and there we get small tastes of what the future looks like, but this latest creation from Boston Dynamics is proof that we won’t be around for it. We’re all dead. And frankly, we’re better off. I have no interest in coexisting with these terror dogs. Then again…. maybe we’re okay for a few years. Call me when these things can ski a double black diamond.